Visiting France’s Champagne region wouldn’t be complete without stopping at the iconic Champagne house of MoÃ«t & Chandon, the country’s largest sparkling-wine producer. Located in Épernay, where it was first established by wine trader Claude MoÃ«t in 1743 as MoÃ«t et Cie (MoÃ«t & Co.), visiting the MoÃ«t & Chandon cellars is simply breathtaking. Spanning some 17.5 miles and situated 10 to 30 meters below ground, the labyrinth subterranean cellar tunnels take visitors past new and nonvintage Champagnes, as well as vintage offerings, including MoÃ«t & Chandon’s much-heralded Dom Pérignon. Tours of the MoÃ«t & Chandon cellars vary, but most end with a Champagne tasting, of course. I’m not quite sure who they thought I was when I visited MoÃ«t & Chandon; maybe I got the royal treatment because the French were shocked by having a wine writer visiting from Utah! At any rate, I got to taste more than my share of excellent Champagne, including some much-sought-after Grand Vintage Champagnes, of which only 70 have been released since the founding of MoÃ«t & Chandon. Not every annual harvest yields a Grand Vintage Champagne for the winery, and Grand Vintage only represents about 10 percent of its total Champagne production. Recently, I got to taste the just-released MoÃ«t & Chandon Grand Vintage 2004 ($60) and MoÃ«t & Chandon Grand Vintage Rosé 2004 ($65). Believe me, it was my pleasure. Sleek, sophisticated, graceful and elegant—those are a few of the words that come to mind in describing the 2004 Grand Vintage from MoÃ«t & Chandon. 2004 was an excellent year for Champagne grapes, as evidenced in this beautiful blend of 38 percent Chardonnay, 33 percent Pinot Noir and 29 percent Pinot Meunier (these are the classic grapes used to make French Champagne). MoÃ«t & Chandon winemaker BenoÃ®t Gouez, with the 2004 Grand Vintage, has created a gorgeous wine that combines longstanding winemaking tradition with New Millennium modernism, particularly in his choice of assemblage—the relative proportions of the three grape varietals, which Gouez chose based on the fruits’ particular qualities as opposed to once-accepted conventions regarding proper assemblage quantities. The result is exceptional. The Grand Vintage bead (the bubbles) is very fine and jewel-like; the hue of the wine is light yellow. On the nose, there are abundant fruit aromas: pear, pineapple, white peach and hints of lemon. Meanwhile, on the palate, the Champagne is lively and bright, with spice and marzipan flavors mixed with grapefruit and mineral underpinnings. After seven years of cellar aging, the Grand Vintage 2004 is rich and complex, creamy, well-balanced and simultaneously intense yet subtle. It’s a fascinating wine. 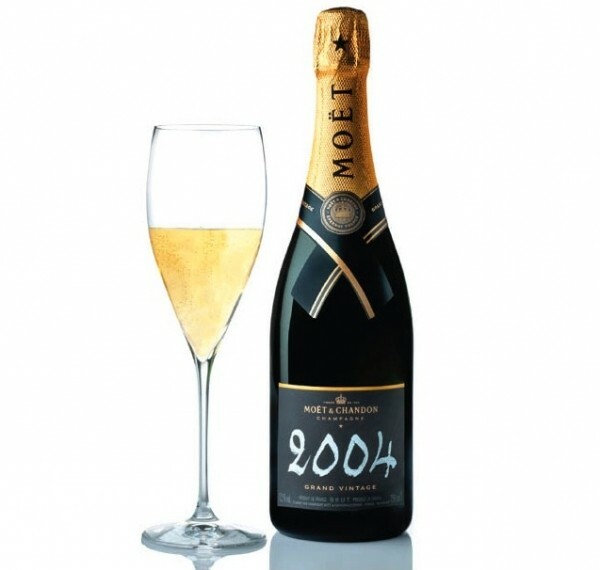 As much as I like the regular Grand Vintage 2004, I really love MoÃ«t & Chandon Grand Vintage Rosé 2004. It’s dazzling both to look at and to sip. Grand Vintage Rosé 2004 is copper-pink in color, a blend of 45 percent Pinot Noir, 31 percent Chardonnay and 24 percent Pinot Meunier. The bubbly is medium-bodied, nice and round, yet delicate on the palate. It’s a Rosé Champagne brimming with blackberry, raspberry and strawberry notes, with hints of anise, and a finish that reminds me of dark chocolate. Keeping in mind that the primary grape used in making this sparkling Rosé is Pinot Noir, it pairs well with Pinot-friendly foods like salmon, foie gras and mushrooms. However, it’s also great with shellfish dishes and pasta or risotto, especially those with creamy sauces. It was a slam-dunk with a Cucina Toscana antipasti of tuna carpaccio with ricotta mousse and avocado, but it was equally appealing paired with saffron tagliolini with a light pomodoro, spicy olive oil and lump crab meat.